If you are looking for information on the Dippin Dots franchise business opportunity, Dippin Dot franchises, Dipping Dots franchising or Dipping Dot franchise information, then you have come to the right place. Where do Dippin' Dots fans go for all their favorite flavors of Dippin' Dots...for Dot Delicacies like cakes and shakes...and to always see what's new from Dippin' Dots??? Dippin' Dots' Franchised retail locations! Recent market research show Dippin' Dots outperformed some of the top franchised ice cream brands 2:1 among kids and almost 2:1 among young adults. 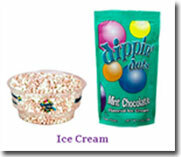 And one fact was very clear, Dippin' Dots were the number one ice cream for FUN among all age groups! Be the first in your area to bring Dippin' Dots to our loyal fans! The list below shows markets currently available with almost endless growth potential. Get started with this great ground floor opportunity for experienced QSR owners. 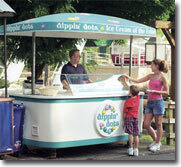 Dippin' Dots Franchising, Inc. offers single-unit franchises for Dippin' Dots retail ice cream stores. An offer is only made after the potential franchisee has reviewed our Uniform Franchise Offering Circular. There are specific criteria for in-line and stand-alone store design. An equipment estimate for a single-site location is included in the formal application package. We are seeking franchisees in many areas to establish a base operation. We have found that enclosed malls, outlet malls, lifestyle centers, strip centers and tourist locations are ideal sites for Dippin' Dots retail operations. Once a retail location has been established, franchisees may elect to seek approval to distribute to area schools, little league ballparks, skating rinks, bowling alleys, and hotels. Franchisees may also elect to retail at fairs, festivals and special events upon approval.